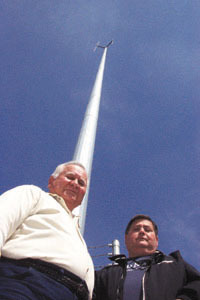 Chester Stasney, Board Member of the Harris County Rural Fire Protection District #14 (Highlands) and Mike Smith, Sheriff’s Deputy, look over the new radio antenna at Fire Station #2 on Wallisville Road. This tower, 199 feet tall, will provide clear and dependable communication for the Highlands Fire Department, whcih before had relied on relays from the Channelview VFD. CROSBY  A boy from Mont Belvieu was tragically killed while visiting his best friend’s house on Thursday, March 13. Friends say the tragedy began as a get-together before an outing which was to include four-wheeling, last weekend. Crosby ESD#5 responded to an accidental shooting call in the 5000 block of 6th Street at about 6:50 p.m.
Detectives say that although there were no signs of life in Travis Hawes, 12, LifeFlight Helicopter was summoned by medics to attempt a rescue. The helicopter was unable to fly because of inclement weather, so Crosby medics took the boy to East Houston Regional Medical Center in Channelview, where he was pronounced dead at 7:52 p.m.
Harris County Sheriff’s Detectives determined the youth had been struck in the right side of the chest by a .22 caliber bullet from a rifle. Detective notes show that the son of Lanny Jeffcoat had been picked up from his mother’s Dayton home that day. The two went to Mont Belvieu and pick-up Travis Hawes and returned to Crosby. While at the Crosby home, a friend of the father visited. Shortly thereafter, a gunshot was heard coming from one of the bedrooms. Detectives say Special Crimes Unit continues to investigate, and sort through evidence as to exactly what had happened, but all agree that there were multiple firearms in the bedroom where the two 12-year-old youths were playing unsupervised. As of presstime no charges had been filed. CROSBY  The Harris County Sheriff’s Robbery Division confirmed that a robbery of an elderly gentleman occurred March 12 in the Nelson Subdivision. According to Harris County Sheriff’s Sgt. Pear, two men knocked on the Krenek Rd. door in the wee hours of the morning. When the man opened the door, the men entered the residence with a pistol in hand, they ordered the man to sit down in his living room. One of the men then went through the house searching. Shortly thereafter, the actors left with a small amount of cash. Ambulance services from ESD#5 attended the resident following the robbery. Witnesses tell investigators that the home was being watched earlier in the day by two men on bicycles. The actors in the case of both the bicycle riders and the alleged robbers were described as black males under the age of 30 years. Crimestoppers offers a reward of up to $5000 for information that leads to the arrest and conviction of persons perpetrating crimes. Crimestoppers can be contacted by calling 713-222-TIPS. A burglary was reported on Church St. on March 11, again, witnesses tell the Star-Courier that two men on bicycles had been casing the building before it was broken into. HIGHLANDS– It has been said that the backbone of any community is its volunteers; those men and women who give of their time and talents to make their community a better place to live and work. Recently, a long-time Highlands volunteer was recognized for his efforts in providing for the public safety of not only Highlands but wherever he was needed in east Harris County. On Feb. 19, Highlands Volunteer Fire Fighter Deacon Tittel was named Harris County Fire Fighter of the Year. Tittel, who has served as a paid Fire Fighter with the City of Bellaire for the past three years, said that this award is given out each year to the top Fire Fighter, either volunteer or paid, in the county. Tittel said that he was especially honored by the award in that he was nominated not by the Highlands VFD but by the Channelview VFD. This is the first time, he added, that the award was given to someone who was nominated by a department other than their own. Over the past years, Tittel has worked with the Channelview VFD as well as others as he was needed. “I’ll help anyone who needs it,” he said. 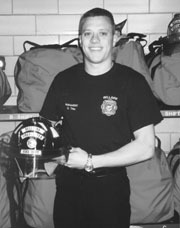 Tittel has served as a volunteer for the Highlands VFD for the past 10 years, following a family tradition. His father, Sam, has served with the Highlands VFD for the 17 years and his mother also volunteered with the department. Deacon is not the first person from Highlands to win the county’s Fire Fighter of the Year Award. Fellow HVFD volunteer Joe Sibery has also been honored. 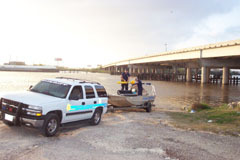 LYNCHBURG BRIDGE  Harris County Sheriff’s Deputies spent much of the day Tuesday searching for a man in the waters under the I-10 bridge near Highlands. A witness called the Harris County Sheriff’s Department at about 9:00 a.m. on March 11 to report that a man has apparently gone down into the water under the Interstate 10 Bridge aboard a truck. Upon arrival at the scene, deputies were told by a man (identified only as living under the bridge) that another man was busy stripping parts from inside an abandoned 1986 Ford F-150 truck when the truck was heard splashing into the water. The man described the other man as having left his identification and worldly belongings outside the truck as he began to take parts from the truck for re-sale. The witness said he had left the man busy at his work and leaving the immediate area to go to sleep. He reports he heard the splash, saw the truck going down and called out to the man but got no answer. The witness specifically says he did not see the man go into the water inside the truck, but that when last seen the man was inside the truck. The man never was heard from again. The witness says he went to JR’s Liquor Store to tell the clerk to call 911 but the clerk didn’t comply. The witness describes then going back to the scene an again searching for the man but didn’t find anything but a state identification card and a birth certificate. The following day, Sheriff’s Marine dive teams found the truck under the water, other deputies had found identification left on land but no body in the water. Investigation continued into the night as deputies employed a Sonar Search of the area. Marine Division personnel at the scene described the current as having been coming into land since the apparent crash into the water and expressed the belief that if a body was under the water the team could pinpoint to a 10 foot radius where the body would be located. There’s a 50/50 chance that their could be a body down there, said a deputy. Other sources say that there is some details that do not add up exactly as described. The identification card does not show the same name as the birth certificate. The description of the man does not match the picture on the card. Other sources say there is no evidence that a man was ever inside the vehicle. As of press time no body was recovered. Harris County Sheriff’s Marine Division Dive Team use sophisticated sonar equipment (deputy holding tube in photo) to search for an underwater body after the roll-in accident in the San Jacinto River. This team recently used the same equipment at Toledo Bend, and located 18 pieces from the NASA space shuttle Columbia. CROSBY  School officials are hoping that just over half of the $73 million dollar estimate for the cost of renovating Crosby schools will be the amount taxpayers have to fund for the next school bond program. Architects of CRE8 reviewed specifications for Crosby ISD Schools with a citizens committee at a meeting on Monday, March 3; the committee was disappointed to hear their recommendations totalled $73M. The total list of recommendations by Crosby ISDs Facility Planning Committee exceeded by twice the recommendations for expenditures by the schools financial advisor, Doug Whitt. Board members and Superintendent Don Hendrix understand the capacity for a new bond issue in the Crosby district is about $45 Million. According to Diane Fleming of Crosby ISD, the most needy school in Crosby ISD is Drew Intermediate and the high dollar recommendations were for Crosby High. Expansion of the high schools library was among recommendations by the committee. Projected growth for Crosby schools over the next five years is expected to reach nearly 3%. There are about 4,300 students in Crosby ISD now. Priority will need to be set before March 19, when a final recommendation will be made to the Crosby ISD Board in time to make a May 3 vote. The committee was comprised of 16 community leaders and four people chosen from the school district. The committee was Cindy Moffett, Tonyette Chenier, Don Cox, Melady Fontenot, Willie Mae Goodlow, Donna Heinlein, Marshal Lawfton, Stacy Lyons, Renee Martin, Woody Murray, Bob Powell, Jerry Prochazka, L.O. White and Tyronne Williams in addition to Michael Joseph, Principal of Newport Elementary and Committee Chairman, Jerry Blizzard of Crosby ISDs Facility Department, Becky Lindsey for district wide representation, Donna Slot for transportation and Susan Blankenship from the faculty. One committee member was unable to attend the meetings due to health problems.